Objective: Established recurrence rates after primary hiatal hernia repair are between 9 and 27%. Lightweight prosthetic mesh reinforcement is effective in reducing recurrence but carries the risk of esophageal erosion. Bioprosthetics may reduce recurrence rates but can be cumbersome to secure into position. We describe a technique to place GORE™ BIO-A™ tissue reinforcement that is simple, fast and provides wide coverage of the hernia defect. Methods: We recruited 17 patients with a hiatal hernia defect greater than 5cm to undergo laparoscopic repair. After primary non-pledgeted repair we placed a piece of GORE™ BIO-A™ material posterior to the esophagus with 5cm overlap. Using an AbsorbaTack™ fixation device, we fixed the material to the under surface of the diaphragm in a circumferential fashion. Results: Seventeen patients, 4 male and 13 female, underwent laparoscopic hiatal hernia repair. Mean age was 58.1 years. Placement of BIO-A™ material took less than 5 minutes in all cases. Follow-up time ranged from 30 to 240 days. There were no recurrences in the follow-up period. There were a total of 4 minor complications within 30 days unrelated to the material placement. Four patients had radiographic evaluation showing no recurrence. 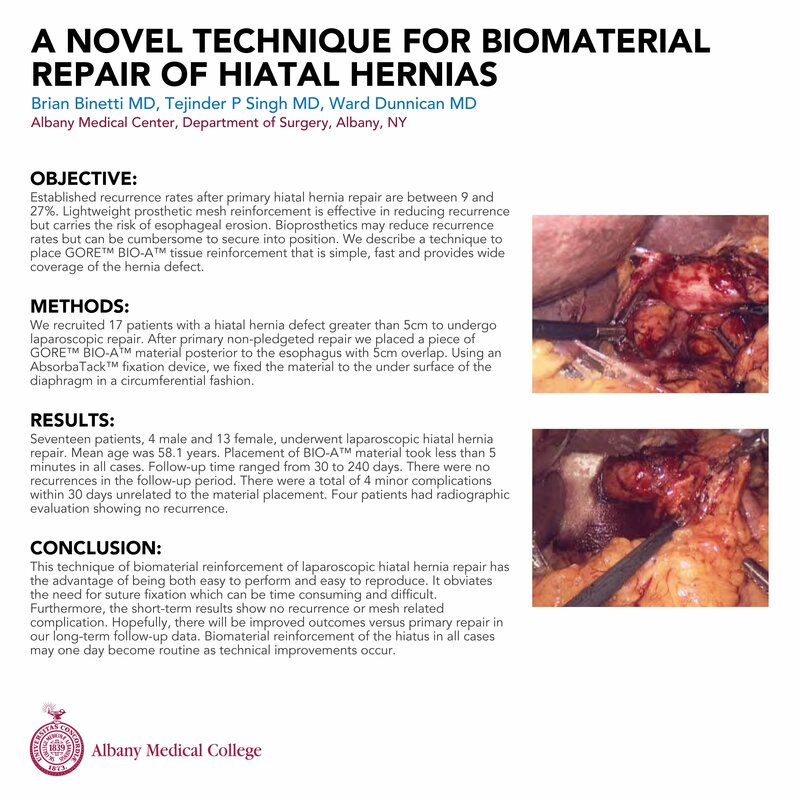 Conclusions: This technique of biomaterial reinforcement of laparoscopic hiatal hernia repair has the advantage of being both easy to perform and easy to reproduce. It obviates the need for suture fixation which can be time consuming and difficult. Furthermore, the short-term results show no recurrence or mesh related complication. Hopefully, there will be improved outcomes versus primary repair in our long-term follow-up data. Biomaterial reinforcement of the hiatus in all cases may one day become routine as technical improvements occur.